Put the pigeon peas in a pressure cooker, add 3 cups of water, fenugreek seeds, peanuts, turmeric powder, salt and ½ teaspoon ghee, close the cooker with the lid and cook under pressure till 2-3 whistles are given out. Reduce heat and simmer for 5 minutes. Heat 1 tablespoon ghee in a non-stick pan, add mustard seeds and let them splutter. Add cumin seeds and sauté for a few seconds. Add asafoetida and sauté for 30 seconds. Add curry leaves, green chillies and red chillies and sauté for a minute. Add cooked pigeon peas and little water, mix and simmer for 1-2 minutes. Add kokum petals and jaggery, mix well and bring to a boil. Add some more water, mix and boil for 5-10 minutes. 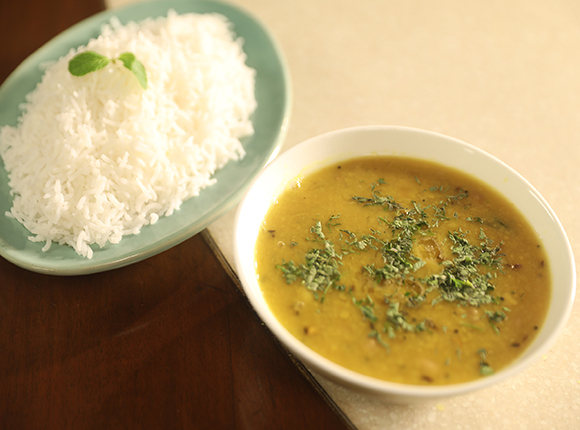 Garnish with coriander leaves, drizzle ½ teaspoon ghee on top and serve hot with steamed rice.